The purpose of hydraulic fracturing is to use high pressure to open up pores in deep fuel-bearing shale deposits so that the oil or natural gas can escape through boreholes to the surface. To make this work, very high pressures (hence, much surface equipment) and a great deal of water are required. To keep the pores propped open when the pressure and water recede, something (usually sand) needs to be included. The inclusion of acid can increase pore efficiency, and because water is a good biological medium, antibacterial agents may be required to prevent fouling. Finally, most of the fracking fluid returns to the surface where it presents a treatment and disposal problem. 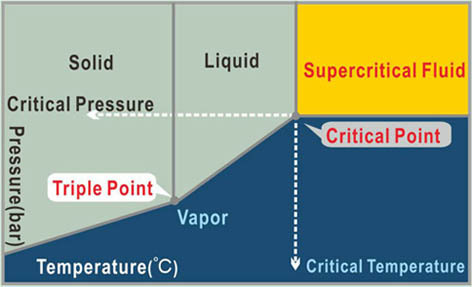 But in theory, any liquid, or supercritical substance, would work, supercritical CO2, for example. According to a study underway at Los Alamos National Laboratory (Middleton et al. 2014) sCO2 has a number of potential advantages over water, and some potential disadvantages as well. The advantages are striking; it requires less pressure (so less equipment) at the well pad, it displaces gas from lower-porosity fractures and mobilizes it from organic inclusions, it mobilizes heaver hydrocarbons, it doesn’t need the additives—maybe not even the proppant—now included in fracking fluid, and, perhaps best of all, it competitively displaces methane from the shale, preferentially absorbing on to it, staying in the shale rather than returning to the surface. That is to say, it is sequestered in the shale; just the thing we need to minimize releases of CO2 into the atmosphere. On the other hand, it costs more than water, and there is little information on its ultimate fate and on how to separate the volume of it that does return to the surface from the hydrocarbons. The preliminary results of the study, all carried out using computer models based on known physical principles, are encouraging. Particularly encouraging is an effect seen in the sCO2 and not in water: an abrupt cooling of about 200ºC when the pressure is initially released, further shocking and potentially further enhancing crack propagation. So, here we have a potential win-win situation; an economic reason to inject CO2 under pressure into shale fields where it may be sequestered, and an increase in the effectiveness of oil and gas production by fracking with potentially less impact than the current hydraulic practice. Time will tell. Middleton, R., Viswanathan, H., Currier, R., Gupta, R., 2014. CO2 as a fracturing fluid: Potential for commercial-scale shale gas production and CO2 sequestration. Energy Procedia 63, 7780-7784. This entry was posted in Emil Morhardt, Fracking, Hydraulic fracturing, Shale Gas and tagged Hari Viswanathan, Hydraulic Fracturing, Los Alamos National Laboratory, Rajan Gupta, Richard Middleton, Robert Currier, Shale gas, supercritical CO2 by Emil Morhardt. Bookmark the permalink.